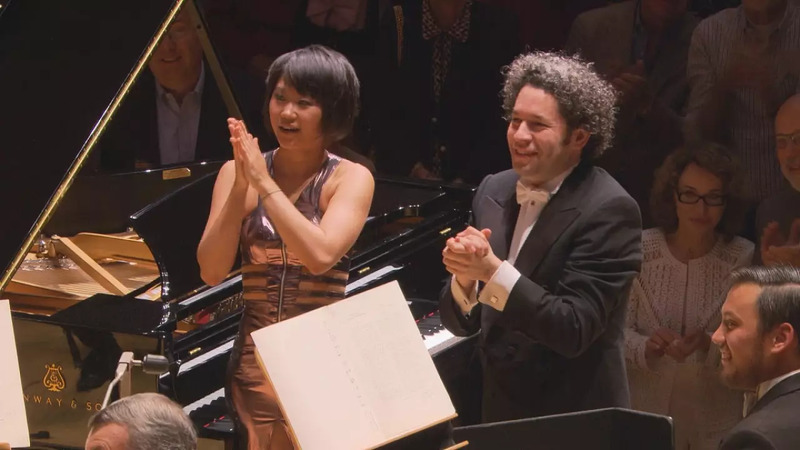 At an association of benefactors: Yuja Wang and the L.A. Philharmonic with Gustavo Dudamel at the helm conquered the Walt Disney Concert Hall with a breathtaking performance of Bela Bartok’s first three piano concertos. Accelerating faster and faster is a typical pattern with Bartok with characteristic features from Hungarian folk music really emerging. At one point Yuza’s fingers move so quickly our cameras have difficulty capturing them. “Everything happens so fast that’s why it’s so difficult, his music,” virtuoso pianist Yuja Wang explained. “In the first concerto you have a special element with the rhythm. Rhythm became lyrical. You know, percussion instruments became melodic, a dialogue between the piano and the percussions that is unique”. Ever since their first collaboration four years ago, the two musicians discovered an obvious affinity. The Piano Concerto No. 1 opens a cycle of three series of concerts at the Walt Disney Concert Hall which combine each concerto of the Hungarian virtuoso with compositions by his compatriots and contemporaries Stravinsky and Janáček.